A total of 435 entrants participated in Event #46 ($3000 PL Omaha Hi/Lo) at the 2013 World Series of Poker. 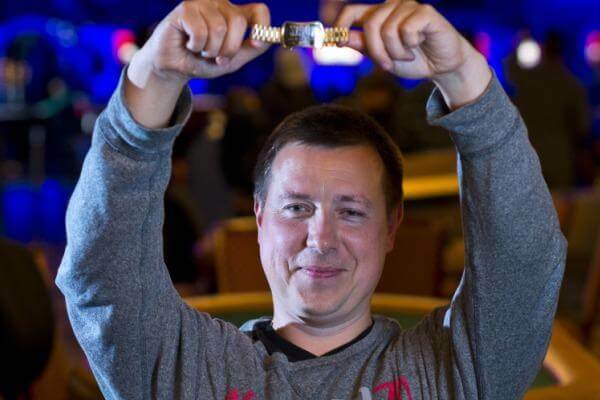 Only 17 players were back on the felt yesterday to fight it out for the grand prize and the WSOP bracelet with Vladimir Shchmelev winning. Alexey Makarov was the 1st player eliminated once the final table started. At this point Ashly Butler started to turn up the heat at the table and he eliminated Allyn Shulman, Andrey Zaichenko, Tyler Nelson and John Cernuto to build a big chip lead. Shchmelev started to make his presence felt on the final table once 4-handed action started. He knocked out Brian Hacker first and then he started to work away at Butler’s stack before he finally managed to stack him off and knock Butler out in 3rd place. Mel Judah made it heads-up against Shchmelev, but the action didn’t last very long. On the final hand of the tournament Judah bet 125K and Shchmelev made the call from BB. The flop was 5h/2c/5d, which gave Judah a set and Shchmelev a full house. Both players got the money in after the flop and Judah found out he was behind, but definitely had outs. The turn brought the 9c and the river was the Qs. Neither card helped improve Judah’s hand. He was eliminated in 2nd place from Event #46. You can follow us on twitter @pokereagles for the latest results as we will be live tweeting from various WSOP events.